64″ wide x 48″ deep x 102″ maximum overall height. Carbon steel tubular frame with manual height adjustment. 304-2b stainless steel inlet tube with dust take off stub and bag inflation system. Inlet tube has an 8″ diameter x 4″ high stub to accept flexible inlet connection. Inlet tube includes food grade inflatable spout seal. All product contact welds are polished smooth. 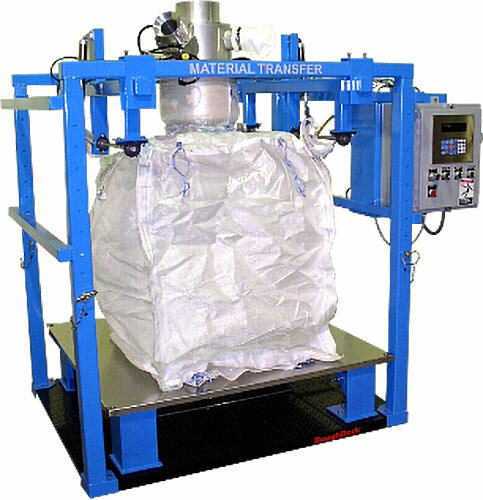 Pneumatically actuated bag strap release system for effortless removal. Densification system with linear vibration and scale isolation. Stainless steel loading deck plate for cleanliness. Painted MTS safety blue with Rustoleum 9100 series two-part industrial epoxy. NEMA 4 rated Hoffman control enclosure. Unit includes a fully integrated gain-in-weight platform scale system.